So the last month or so has been a busy one for me. Mum and dad were over and kept popping in from time to time. And I went on 4 overseas weekend trips for 4 weeks in a row. Friday 19th – Monday 22nd September – Prague with my Aussie mates, Luke and Tony. Saturday 27th – Tuesday 30th September – Paris to meet mum and dad after their Europe tour. Friday 3rd – Sunday 5th October – Barcelona with my workmates for teambuilding. Saturday 11th – Wed 15th October – Palma, Mallorca with Bibi for sand and sun relaxation. In the meantime, photos are available at my picasaweb account. 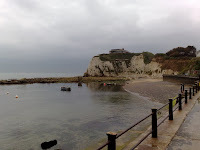 Over the last weekend, Mum, Dad and I headed to the Isle of Wight for an overnight weekend stay. And I have to say, I was impressed! I think it was the coastal feel that really worked for me. It reminded me a lot of home, with a more relaxed atmosphere than I’m used to in London. 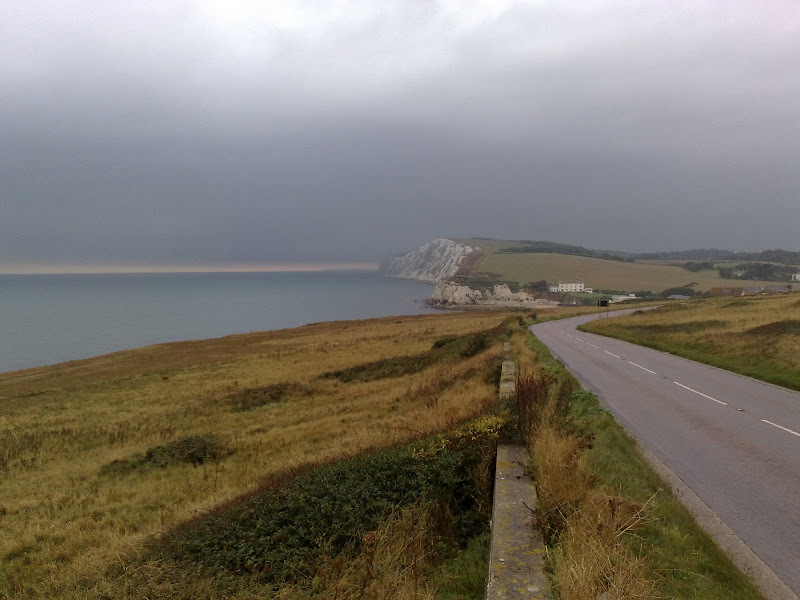 Probably the highlight was driving along the southern coast road from the Needles along to Ventnor. The road has some fantastic views back to the Needles and we had some pretty atmospheric weather which I think made the pics even better! 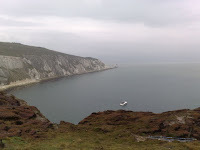 So Isle of Wight, well recommended! So next morning, we bade farewell to Oracle and continued off on our Greek journey. Next stop, the monasteries of Meteora, built high atop natural sandstone pillars. After a little bit of trouble working out how to get a bus ticket, we finally managed, and jumped on a bus down the hill to Amfissa, the nearest big town, where we could then catch an onwards bus toward Meteora. A little more trouble working out how to get tickets and we were on our way, through Lamia, Karditsa, Trikala and finally arriving early evening at Kalabaka (or Kalampaka), the biggest town at the foothills of Meteora. As soon as we stepped off the bus, a number of local hoteliers were waiting, trying to get tourists to come to their hotels. As we hadn’t booked ahead, we went with one of the guys to a little hotel which, while reasonable, was nothing much to look at. We headed back out after checking to check out the place, and were met with the most surreal sight. The town of village is immediately below the sandstone pillars, and at night, there are large spotlights illuminating a number of the pillars. So all we could see were these looming, large, floating rocks in the sky. Fantastic sight! The next morning, we headed up to the monasteries themselves. What a great place! There were about 5 or 6 big monasteries on top of sandstone pillars, some 300 odd metres high. Each pillar only just big enough to hold the monastery at the top. Apparently, way back when, the only way to get up to the top was in a rope net basket that was hoisted up to the top. I can’t imagine how hard it would have been to build! Nowadays though, there are steps carved into the rock, so tourists can enjoy the monasteries. (which are still in use, I might add) And the view from the top was fantastic, looking down over the plains of mainland Greece. We headed into one of the monasteries and saw the quarters and the chapel. There wasn’t a whole lot of space, and I couldn’t imagine living there for any long period of time, but I guess, that’s what monks do. And we even saw where the rope net hoist was housed. “Sure, occasionally the rope snapped…” the monk happily noted. Yikes! All in all, it was truly a unique and inspiring sight, and a great experience! On the way down the hill, we stopped at a little restaurant for lunch and had gyros. Gyros is basically like a Greek version of a kebab, with tzatziki. Yum yum! And on the approach into town, we even hit a little touch of home, with the Sydney Hotel, complete with map of Australia, and a kangaroo! Next stop Igoumenitsa, for the ferry to Italy! So onwards to Delpi. On the bus the jet lag hit a little and I slept for quite a lot of it, lucky Beth was there, otherwise I would have slept right through our stop! Found a nice little hotel in Delphi to stay at and then after a quick shower, we headed out to grab some dinner! We had tzatziki, red wine and I had Moussaka! (gotta have something greek hey) It was really nice! After dinner, headed back to our room and straight off to sleep! So tired, I slept like a log! Woke up this morning to the most gorgeous view out over the mountains and the Gulf of Corinth. Headed down for breakfast of bread and jam and juice. Mmmmm. Plans at this stage are to stay in Delphi tonight, head up to Meteora and then across to the Igoumanitsa where we’ll get the ferry across to Italy! How very exciting! So we headed out today to see the ruins. It was about a 15 minute walk down from our hostel along a ridge with more glorious views across to the Gulf of Corinth. The ruins were really quite cool. These were my first real ruins since I’ve been over here. I’d glanced at the Parthenon in Athens through the rain and the smog, but we left pretty quickly after that so I missed it. We wandered around the grounds of the ruins, seeing where the Oracle used to be, as well as the amphitheatre. We also headed into the museum there, to look at the recovered artifacts, however all the captions were in Greek! It was all Greek to me as they say! Nevertheless, it was awesome to see these artifacts on the same mountainside where they were discovered. Afterwards we wandered back up to Delphi town and had some more tzatziki and wine and looked at some souvenirs in the local shops. Tomorrow we’ll head off to Meteora to see the monasteries on top of stone columns. Sounds strange but cool! Well! I’ve done it. I am now across the other side of the world, northern hemisphere! CRAZY!!!! Just a quick note to let you know I made it safely to Singapore. Almost missed my flight due to my slackness and not being ready in time. But never fear, I made it there with a few moments to spare. The flight was excellent. They just kept bringing drinks (orange juice all the way mmmm) and the food was quite good. Chicken with tomato and olive sauce. Yum! With a Magnum Mini for dessert! Playing on the free internet now at Singapore airport and talking to my bro on MSN. Little Amy was on earlier with me also! Thanks guys! Appreciate the company! I’m getting very tired since I’ve been up since 6am and only got 4 hours sleep last night (again, I’m a slacker). But all in all, apart from some craziness this morning (I was stressing badly), I’m travelling well and am very excited. Then who knows what the future holds! I have no idea, and I love it! Yep, after almost missing the flight from Brissie (geez I’m slack), the Bris to Singapore leg went off without a hitch. 4 hours at Singapore, I discovered that I love travelators (the moving walkways) cos I can walk twice as fast, I bought some lollies at seven eleven! And I talked to Dave and Lizzie! So landed in Athens and after a few confused moments, found my luggage and my way out to meet up with Beth! Really good, and a little surreal to see her again in person! Unfortunately it was rainy but we headed off and jumped on the train back to Monestiraki(?) to get Beth’s stuff and then after a couple of crazy taxi rides (and 45 minutes trying to find a cab that would take us) into the city to send some of Beth’s stuff off, we managed to get to the bus station and onto a bus up to Delphi.